In February, I endorsed libertarian-Republican Ron Paul. My confidence that, if elected, he would be the best president in generations is unshaken. Naturally, I voted for him in Michigan’s presidential primary. Unfortunately, by Dr. Paul’s own admission, his nomination at the Republican Convention in Tampa is extremely unlikely. In fact nothing short of Romney’s exit from the contest would make it possible. I don’t wish to discourage Ron Paul delegates. They have an unprecedented opportunity to give the Republican Party a more libertarian national platform, and they have the numbers to do it; delegates are committed to a candidate on the first ballot, but no such restraints apply to matters of policy. So where do we go from here? There will be a number of choices on the ballot. The typical approach for supporters of a Republican candidate is for those people to rally around their party’s nominee, but Ron Paul supporters are not motivated by a love of politics as usual. Rather, they are motivated by a message of maximum liberty in the context of a constitutionally limited republic, and a desire to elect a president who feels as they do. Gary Johnson and Scotty Boman at Libby Fest. He vetoed 750 of the bills that were passed by the New Mexico legislature; more than all other governors combined. He cut over 1,200 government jobs without firing anyone. He got government out of the way thereby allowing for the private creation of 20,000 more jobs. He left New Mexico with a budget surplus. He cut taxes 14 times while never raising them. …the list goes on. 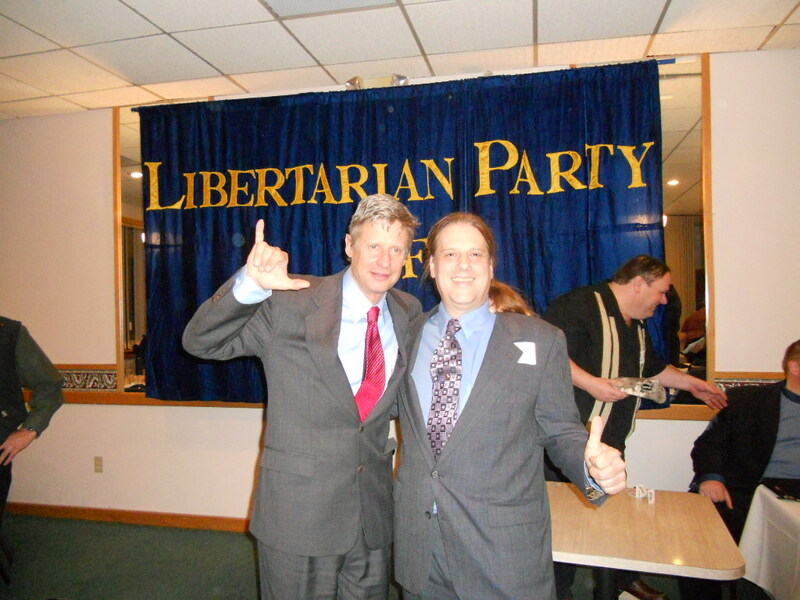 Throughout the early Republican campaign for the nomination he repeatedly advocated libertarian solutions for national problems, and as a two-term governor he enters the race with stronger political credentials then any other Libertarian nominee, and he has more executive experience then Barack Obama and Mitt Romney combined. Furthermore, a vote for Gary Johnson is a vote for the party of principal. The Libertarian Party has been the choice for advocates of individual liberty and limited government for 40 years. Many of it’s founders were Goldwater Republicans who were disgusted with Nixonian statism. In 1988 Ron Paul was the Party’s nominee President. At the 2012 convention, delegates nominated Judge Jim Gray as Gary Johnson’s running mate. Judge Gray is an outspoken critic of the war on drugs. For these reasons, I wholeheartedly endorse the Libertarian candidate, Governor Gary Johnson, as my choice for President of these United States. This week President Obama met with Mexican President Filipe Calderon. Last month Secretary of State Clinton also met with Mexican officials. In both cases, Mexican officials blamed our gun rights for drug cartel related violence near our shared border. The Mexican government considers our liberties a threat, and our own administration seems inclined to concur (Though Obama has backed off, thanks to the political vigilance of patriots). So, for now, his solution is to expand the enforcement of substance prohibition. Conservatives are sure to complain that Obama has not been standing up for gun rights and improved boarder security, but they will also applaud his efforts to escalate the drug war. In this way conservatives are as wrong-headed as Calderon, Obama, and Clinton; conservatives will trade in their right to keep and bare arms just to stop their neighbors from getting high. Put another way, they are willing to let the liberals burn the second amendment, before they will allow their neighbor to burn a fatty. Libertarians have no desire to control the personal behavior of others, so long as it does not threaten the rights of others. Put another way, we believe in locking people up because we fear them, not because we are mad at them. Drug prohibition is the cause of drug violence. The profits made by the cartels, and the thousands of bodies left in their wake, are the result of US laws, but not the second amendment. This is just one example of how the two sides of the statist coin fuel tyranny. Unfortunately, the mainstream media likes it that way, so as the conservatives cry about us losing our second amendment rights, the gun grabbers will point out the growing death toll in Mexico. As conservatives say, “build a fence,” the drug smugglers and criminal gangs will find more innovative ways to bypass it, or even exploit it. I say freedom is the answer. Don’t let a foreign leader talk us into surrendering our rights. End the unconstitutional and intrusive drug laws that caused this crisis. Then we will have a border that is much more manageable, and lives will be saved. This isn’t the first time a foreign leader objected to American guns. Many people will be celebrating Patriots Day. This would be an excellent time to remind our neighbors what led up to the “shot heard around the world” and what those before us had to give up, to manifest the vision of liberty that so many Americans have taken for granted or forgotten. I Congratulate you on your re-election to the United States Senate. As an opposition candidate turned constituent, I hope your future votes in the United States Senate make me happy you won. I hope this message reaches you. I know what it is like to get more mail than one has time to read. Clearly you are blessed with an even larger volume of mail than I. As a candidate and an activist in a third party, I wish to express my deepest gratitude for your September 10th press conference. I was especially impressed with the respectful manner in which you handled unexpected surprises. By resisting the demands of the Republican Leadership and giving a forum to their opposition, you have put your own re-election to Congress at risk. We are blessed to have such a courageous person in Congress. In Michigan, I had the fortune of being the Libertarian representative at the first meeting of the Michigan Third Parties Coalition (MTPC). One thing I learned through this experience, is the value of respecting people who hold to beliefs that conflict with my own. The formation of the MTPC was initiated in a letter sent out by a socialist, Matt Erard. He understood the need to form a group that was non-ideological. Ideology is more than symbolic for people in the freedom movement, but there is a need for Detente in cases where people with irreconcilable differences face a common threat. Clearly you get that. I only wish everyone in our movement were so enlightened, but I have no right to apologize for the short-comings of others. Without honest elections, the hope for peacefully bringing about a free society is dashed. Those who honestly believe in the correctness of their beliefs have nothing to fear from an unfettered candid discussion of the transcendental challenges of our time. When the debate process and other parts of our broken election system are remedied, it will be much easier to bring about liberty in our time and resuscitate our constitutionally limited republic. Thank you for bringing us one step closer to that day. Libertarians everywhere owe you a great debt of gratitude. We are on the verge of a major depression if the current policies continue: Deficit spending, paying off debt by printing money, exporting our industrial base, imprisoning large portions of the population, and wasting our resources and lives on unprovoked military crusades. The Republican President and Democratic Congress have continues on the same course like a canoe team riding the rapids to Niagara Falls. Bad economic times, like these, call for a more comprehensive plan. Libertarians, with their support for free market reforms such as eliminating the Income Tax and reducing burdensome regulations, suggest even more ways to increase opportunities and improve the economy. The only way to end the income tax and pay off the dept is to change policy and cut spending. The first cuts should be in areas where the Government is doing the most harm, while leaving programs people have grown dependent on (like social security) intact. Then phase them out gradually. The younger generation should be able to opt out of social security.